Fuku-chan & Sayashi & Maa-chan: Aloha~! Fuku-chan explains their opening greeting by saying that the three will be in Hawaii on the day this episode is broadcast. At this point they’re still in Tokyo recording the show though, and Fuku-chan asks the two how they’re doing with their preparations for Hawaii. Sayashi says she hasn’t done a single thing yet — she only just found a carry case at home today. Maa-chan immediately asks Sayashi what color her carry case is, and Sayashi says it’s somewhere between orange and pink. Maa-chan says she hasn’t done anything yet either, and Fuku-chan admits that neither has she. Fuku-chan wonders how many changes of clothes she should bring with her. Sayashi says they’ll probably be mostly wearing outfits provided by the office, so just bringing T-shirts and Relaco should be enough. Fuku-chan mentions that August 23 is Ukulele Day in Hawaii. She has a DVD where the members of Berryz practice playing “Happy Birthday” for Risako on the ukulele, so when she got the opportunity to play one herself, she remembered that scene on the DVD and tried to see if she could play it, and to her surprise she found that she actually could. Sayashi is surprised to hear this and they hope they get a chance to play some on this trip to Hawaii as well. The three take turns in answering a question about what they’re generally doing before concerts. Fuku-chan says she applies lip balm given to her by Kenshuusei Yamagishi Riko, Sayashi says she drinks black tea, and Maa-chan says she fixes her hair. Fuku-chan says this is the first time she’s heard about Sayashi’s tea thing. Sayashi explains that it’s not like she has to drink it every concert, but since hearing other artists saying they drink sweet teas such as herb tea, she’s gotten into the habit of doing so to help herself keep her throat in good condition throughout the concert. Fuku-chan: As for Maa-chan, you fix your hair, huh? Maa-chan: No. I double-check the lyrics. Fuku-chan: …Oh. So you changed your answer. Fuku-chan mentions how the other day she had her hair done curly for Hello!Con, but the curls got undone and she was talking to her manager about what she should do. Maa-chan suddenly offered to fix Fuku-chan’s hair for her, and she first weaved it and then braided it for her. Even though there was hardly any time to spare, Maa-chan pulled it off in no time and Sayashi says it really suited Fuku-chan. Maa-chan says she wants to change back to her original answer after all. Fan mail #1: The listener asks what their initial feelings were hearing about Berryz Koubou’s indefinite hiatus announcement. The 9th, 10th, 11th gen members were told about it on the day of the concert after they’d finished doing their warm-up stretches. They were suddenly just called over and since none of them had any idea what it was about, Maa-chan thought she was going to get a scolding so she ran and hid behind Harunan. Their initial feelings of confusion were caused by the word “indefinite hiatus” — “until when exactly is the hiatus then? !“, Fuku-chan thought. Afterwards when Fuku-chan ran into Fukuda Kanon, the two of them just got all depressed together, both of them thinking they’d lost their reason to live. Sayashi says that although she only recently became a member of Hello! Project, Berryz Koubou has been a part of her life even beforehand — she says she loved songs like “Nanchuu Koi wo Yatteruu YOU KNOW?” That’s why it feels weird to her hearing about Berryz halting their activities next spring, but says that their members would probably wish for the remaining members of Hello! Project to pick up the torch so to say and keep doing their best. Sayashi says she wants to fulfill those expectations. Maa-chan says she actually didn’t even believe the manager who first told them the news. She thought it was definitely some kind of a prank. It was only at the rehearsal afterwards when it really hit her. Yajima Maimi cried, all the members of Berryz cried, even the staff members near the front of the stage were getting teary-eyed — and Maa-chan had to sing her song right after that. Fuku-chan didn’t know how to react to the news. Obviously she felt sad, but she reckoned that the members of °C-ute who were with them from the very start must’ve been even more heartbroken about it. So even though she was sad, she felt like it wouldn’t be right for her to cry about it. The three all agree that the one thing they can do is watch and learn more from Berryz while they still can. Fan mail #2: The listener talks about how Sayashi is famous for talking about her love of the members’ specific body parts on radio and in magazines — he cites the notorious case of Sayashi often praising Fuku-chan’s skin. Thus, this time the listener asks the other two hosts to describe their favorite parts of Sayashi in good detail. Fuku-chan says she’s heard the rumors about Sayashi talking about her skin from their fans at handshake events and such. Sayashi says that she in fact just talked about Fuku-chan’s skin again at the latest episode of RIHO-DELI she recorded. Fuku-chan also knows about Sayashi’s love for Ishida Ayumi’s mouth and Abe Natsumi’s skin. In addition, Sayashi mentions she loves the bridge of Maa-chan’s nose. Maa-chan, in turn, says she likes Sayashi’s nose, mouth, teeth and forehead, and Fuku-chan chimes in saying she likes Sayashi’s teeth, too. Sayashi says she doesn’t think her face is that special as a whole, but it’s “okay” when examining its parts individually. She says she’s definitely no “one-in-a-thousand-years” perfect beauty or anything, but she does get complimented on her teeth every once in a while. Maa-chan says she also likes Sayashi’s small jaw and her hands. She says she’s recently noticed how Sayashi’s hands have gotten slimmer, and when she mentioned this finding to their manager, they replied it’s because Sayashi’s lost some weight recently. Sayashi says her hands tend to get bloated really fast if she puts on weight, and flights cause her limbs to get really swollen. Fuku-chan says she likes Sayashi’s teeth when she laughs — not the full-on laugh, but the cute chuckle. Maa-chan says she likes Sayashi’s laugh when she’s talking to Michishige-san, and Fuku-chan comments that Maa-chan’s examples are getting harder and harder to comprehend. Fuku-chan notes that Suzuki Kanon really likes Sayashi’s nails, and Maa-chan says that she, too, used to like Sayashi’s nails once. “Used to? !“, asks Fuku-chan, laughing. Sayashi is happy to receive all these compliments, and says she can already a feel a boost in her self-confidence. Finally, Fuku-chan mentions that she thinks fans definitely love Sayashi’s thighs. Sayashi is aware of this, and lately she’s kind of feeling embarrassed about them and is doing her best to tighten them up. Fuku-chan says she especially loves watching Sayashi’s thighs when she’s dancing to “Resonant Blue” — she then explains she said this just to get back at Sayashi who’s constantly saying pervy things like this about her. Sayashi apologizes to Fuku-chan for saying that sort of stuff about her so much, but does thank her for the compliment. “Hyahhoi ♪( ´θ｀)ノ”, replies Fuku-chan. Fuku-chan: Join us on Morning Jogakuin again next week! 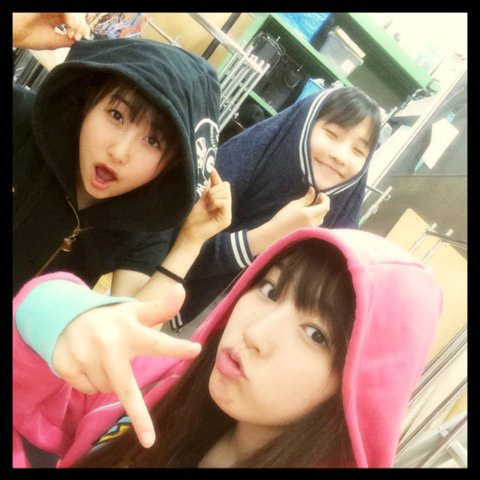 Fuku-chan & Sayashi & Maa-chan: Oyasumizuki~! Rihoriho is probably comparing herself to the Berryz members who have been there for over 10 years. What with all these YURI atmosphere I’m sensing. Oh yeah. I remember that one.